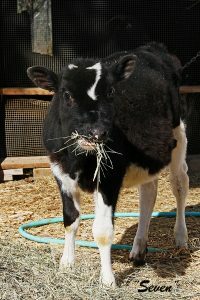 Seven is a rescued cow at Merciful Maiden Critter Haven. 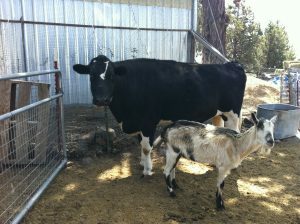 She arrived as a calf in the picture to the right. She has really grown. Seven is extremely friendly, loving to lick your face if she can. She comes when her name is called, and her moo is quite melodious. Her best friends are the llamas and the donkeys. Merciful Maiden Critter Haven is so grateful she is here and able to have a quiet life. This is Seven, the Cow, today. As you can see from the pic below, she has grown considerably. She loves “her goats”, and she thinks that all of the goats are “her goats” and gets very concerned if she thinks any goat is in distress. She still gives very sloppy slobbery kisses upon request. Gotta love her!